At its heart Dynamics CRM is an endlessly customisable platform, and this freedom allows Partners such as ourselves to take the existing Service Module of CRM and build towards a true Asset Management System for tracking complex assets and managing Case Handler Diaries. Service Management within CRM allows for the creation of Process flows, Business Rules and Workflows to tailor the solution to a particular Business – however this struggles to accommodate a scenario where this logic needs to vary massively by the Client or Asset Type involved. Allow Cases to be assigned to multiple Case Handlers to build the Internal Team responsible for managing that Asset - Case Handler for Pricing + Case Handler for Sales + Case Handler for Service Management. Support Client-specific Workflow that would generate different Prompts, Alerts and Tasks to each Case Handler depending on the Client and Type of Asset being managed. Model the different Management Stages that each Asset, to divide Related Parties, Activities and Expenditure between each Stage. The Asset is passed over to us from the Client with a specific Instruction over what Activities or Outcomes the Client wants to see from their Asset. The Asset Manager must then plot the course of how they will manage the Asset to achieve these Outcomes. Alongside the core Requirements that are instructed to us by the Client, both in terms of compliance requirements and core actions that the Client expects to see. In this way of build the architecture for our Asset Management CRM, we could define the asset instructed to us as a series of requirements – and then map this into the Service side of CRM in the form of a Case underpinned by a series of Case Requirements. Each Case Requirement then defining a Required Action for the Case, whether this be a Compliance Email, Task for the Case Handler, Required 3rd Party or SLA. With each requirement being tracked by CRM, we can define which member of the internal team for that Case should ‘own’ the requirement – so that the resulting Activity or SLA is assigned to the right Case Handler to build their diary for that Case. In this we define which Case Handler should own each Requirement and build their diaries accordingly. To solve the problem of client-specific workflow, we can allow the definition of rules or trigger points within CRM to be built into a ‘book’ of rules for that client or asset type. These rules can then be defined as Client Case Requirements, defining the Case Requirements that should be added to a Case for that Client. This produces a matrix of rules associated between the Client and the Type of Asset. From this, Client Plans are our key entity that drives the internal logic and calculations behind the Asset Management Solution, allowing the system to fire different activities to the Case Handlers depending on the Client for that Case. 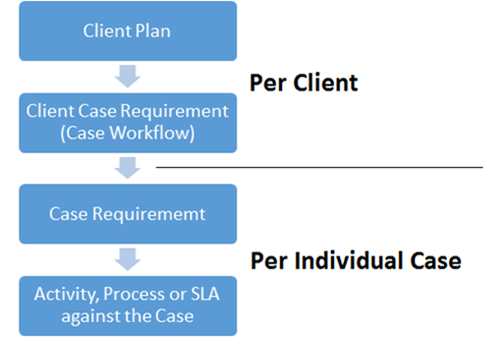 So when the Case is first recorded, the system determines which Client Plan should be used based on the Client and then consults this Client Plan at each step during the Case Lifecycle (or individual Services within the Case) as way of determining what Emails, Prompts or Work Instructions are required for that Client at that step of managing the Case. Managing complex assets can be unpredictable and certain requirements may be applicable for a Case depending on various factors. To cater for this, some of the Client Case Requirements we define may need to be conditional on a particular Field or Flag within the Case – so our logic needs to be able to look at these conditions and optionally add a particular requirement to a Case.